The behavior of quantum dots – nanometer-scale semiconductor formations that have many of the same quantized properties as atoms when interacting with light – is a subject of intense interest in condensed-matter physics. Now researchers supported by the Joint Quantum Institute’s Physics Frontier Center have devised a method of controlling those interactions to an unprecedented degree. Typically, the dimensions of the cavity surrounding a dot are permanently fixed in the fabrication process, limiting the range of phenomena that can be observed. 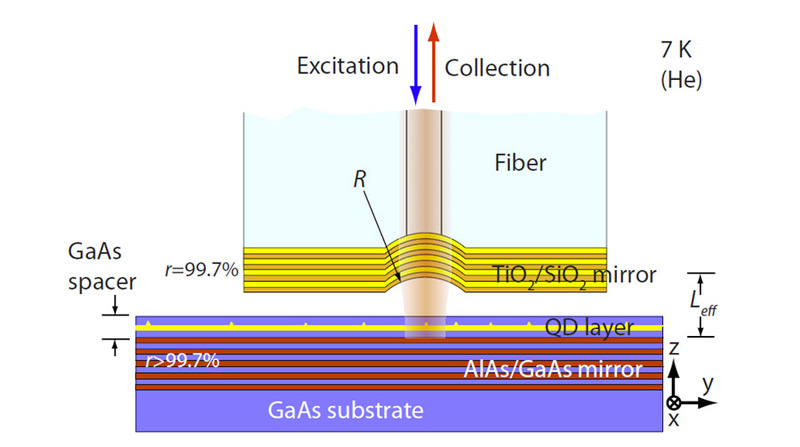 The new technique makes the cavity size adjustable: The cavity base is the traditional planar mirror below the dot; but the top is made up of a concave mirror (yellow and orange in the illustration to right) attached to a fiber-optic strand. The top section’s distance from the dot can be controlled by exquisitely sensitive actuators. That permits scientists to tune the way that the dot-cavity complex responds to light, and allows much higher collection efficiency for emitted photons. The design may make it possible to observe strong coupling between the excitation beam and the resonance states of the dot-cavity complex – a long-awaited development in this field of physics.